Scientists have declared dolphins to be the world’s second most intelligent creatures after humans. Lori Marino, a senior lecturer in Emory University's Neuroscience and Behavioral Biology Program, has been using MRI scans to study the brains of dolphins. 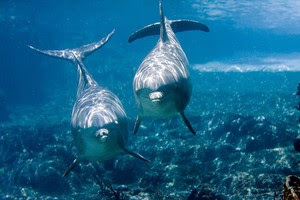 The scans revealed that dolphins are extremely intelligent and when compared to primate brains, dolphins were found to be more intelligent than chimpanzees. The revelation drew Marino to conclude that dolphins should have the same status as humans. In additional studies dolphins have been found to have distinct personalities with the ability to think about the future and Diana Reiss, professor of psychology at Hunter College of the City University of New York, discovered that dolphins can recognize their image in a mirror as a reflection of themselves. Marino and Reiss will present their research findings and explore the ethical implications of mistreatment at the 2010 AAAS (American Association for the Advancement of Science) Annual Meeting in San Diego next month.